This image generated a fair bit of conversation on our facebook page, so we thought we post it on our blog for even more people to enjoy. 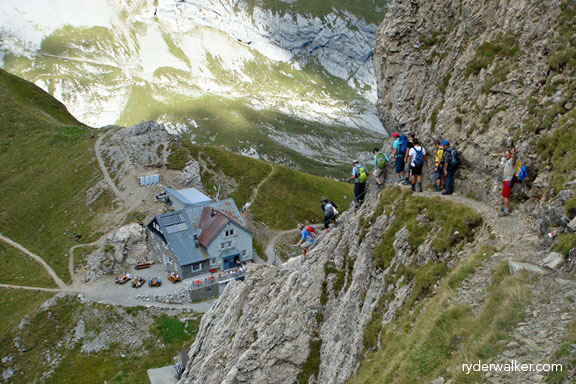 Ken Fuhrer shot this image of our crew descending to the Berggasthaus Rotsteinpass (2120 meters) during one of last year’s private hiking tours through the Appenzell region of eastern Switzerland. The hut at the Rotsteinpass occupies a strategic position for climbing the Altmann (2435 meters), the second highest peak in the Alpstein mountain range. The climb is a relatively easy one, but as you can see from the photo, it is not for the acrophobe.